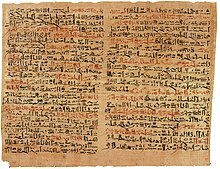 The Edwin Smith papyrus, the world's oldest surviving surgical document. Written in hieratic script in ancient Egypt around 1600 B.C., the text describes anatomical observations and the examination, diagnosis, treatment, and prognosis of 48 types of medical problems in exquisite detail. Plate 6 and 7 of the papyrus, pictured here, discuss facial trauma. Ii panna ke 19 February 2018, ke 16:50 baje, pichhla time badla gais rahaa.